Libraries, archives and museums are charging forward to digitize paper documents, providing access to more collections to more people than ever before. But how are these compilations being used? In the rush, they’ve stuck with metrics like clicks and downloads, Ricardo Punzalan, assistant professor in the University of Maryland’s College of Information Studies, found. Supported by a seed grant from the University of Maryland and the Smithsonian, Punzalan, together with Brian Butler of the College of Information Studies, and Robert Leopold, deputy director of the Center for Folklife and Cultural Heritage at the Smithsonian, had a question. What were the effects of digitizing ethnographic information and were those effects being captured? “It’s not contributing to anything unless people are using them and we need to understand how people are using collections that are put online,” Punzalan said. What are the meaningful impacts for the institutions? Is it a dying language being relearned or does it help a community establish land ownership, he asked. Over 50 individuals and seven institutions were interviewed during the research, assisted by three students under Punzalan and one under Leopold, and they said very few, if any, mechanisms were in place to measure significant impact, just general ones. It found institutions weren’t happy with their collection measures, either. Gathering only clicks and downloads makes it hard to evaluate the efficacy of digital programs and projects. Punzalan suggested large, robust data was more valuable in conjunction with anecdotal evidence. “So you can explain, with evidence, the meaningful contributions of your practice…it’s those two things combined that make you convincing,” he said. The findings have led to more research questions. This research was the first step in determining what could be done to improve ethnographic collection impact assessment. The next phase will focus on one, diverse collection that involves several communities. Going from broad to specific will help further understand assessment needs. 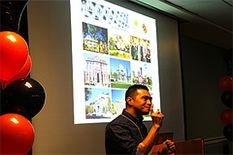 Punzalan applied for a federal grant to continue this research. Digitizing collections is the most “revolutionizing technology for many libraries, archives and museums,” but Punzalan is driven to make the products of digitization more useful for both cultural heritage institutions and their audiences. On October 30, 2014, the University of Maryland and the Smithsonian Institution celebrated another year of research results stemming from it's UMD-Smithsonian Research Seed Grant program, which began in 2009. The celebration included lightening rounds by 2013’s seed grant winners and the announcement of 2014's winners. See tweets and photos from the celebration here.